Glaro, a leading USA manufacturer of waste receptacles, recently introduced a new format to present its recycling receptacles: Glaro RecyclePro modular recycling stations. The only system of its kind, Glaro all metal modular recycling stations, are the largest and most versatile line of metal recycling containers on the market offering an extensive selection of sizes, finishes, openings, and messages. Part of the RecyclePro recycling series, which promote environmental sustainability to your audience, Glaro modular recycling receptacles allow you to create your own recycling station with two or more receptacles, which are held together with a simple connector. Designing your own station is straight forward. You pick the diameter you would like (either 12”, 15” or 20”), the type of top opening you would like (e.g. slot for paper, small hole, large hole for waste, or multipurpose opening), the message for each opening diameter (e.g. paper, bottles, bottles and cans, waste, and recyclables), and the finish color you would like for each top and body. The cost is the same for any type of opening selected. At no additional cost, a standard Glaro silk screened message for the front of each recycling receptacle unit is included. All connector brackets are included. 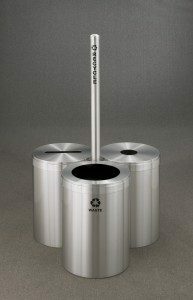 For those who want to create more visibility for the recycling receptacle stations, connected units with a 72 inch sign post (seen in photo on the right) are also a great option to consider. These easily identifiable silk screened sign posts draw attention and are very useful in public areas. Download the RecyclePro Series of modular recycling receptacles brochure here. You can specify which standard silk screen message and sequence of message that you would like. Custom silk screen messages and logos are also available upon request. 31 finishes are available (29 smooth and textured powder coat finishes plus, 2 metal finishes). You can choose the color of the cover and the body. You may match or contrast with the cylinder body and other recycling containers in the station. Custom finish combinations are available too. When two or more recycling containers are used side by side, they may be connected to each other in the sequence you specify. Three unit recycling stations can be configured in a straight line or even in a triangular formation. In this series, the need for an inner steel container has been replaced by using heavy gauge custom size poly bags that are designed to have snug fit. Steel containers are available as an option. Finally, Glaro’s RecyclePro recycling container stations are designed to accommodate any facility and any size budget. They are the favorite choice of industry dealers, architects, designers, purchasing agents and facility managers for any type of public building.